Installation is quick and easy and can take as little as 90 minutes to fully install our standard alarm system. Installation of our wireless ZeroWire™ panel is a trouble-free process and quiet process. All our sensors are wireless therefore the only power required is a plug socket for your Alarm panel. You don't have to worry about someone pulling cables throughout your home, with the ZeroWire™ that is now a thing of the past. What are the installation times? We have both morning and afternoon slots. Please make sure you request the most suitable time for you and we can do our best to accommodate you. A HomeSecure engineer will be in touch either the day before or the day of the alarm installation with a more specific time. 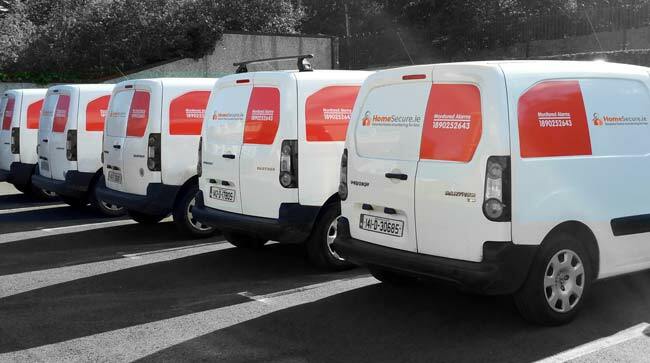 Yes, although our main office is Dublin-based, we offer home alarm installations throughout the Republic of Ireland. We have dedicated engineers around the country, ensuring a quick turn around on your installation date. How much is the installation? Installation itself is free of charge. When you purchase a new alarm system, the installation will be covered in the €99 price. How long do I have to wait for an installation date? We've next day installations available and we can generally fit you in you for a home alarm installation within 2/3 working days. Booking is easy, all you have to do is pay a €99 deposit and let us know a date that suits you. That's it! How much are service charges? Service charges are completely free of charge during our usual business hours. This means you'll be covered in your monthly monitoring and maintenance fee for labour and parts. You will also avail of a free annual service of your alarm system every year.